Google Maps won't stop for anything, not even a cow's privacy or your desire to hide the Millennium Falcon from prying eyes. The Google Street View car didn't even bother stopping to enjoy a rare total solar eclipse. We know because the car in Maryland Heights, Missouri, on the edge of the line of totality, was taking pictures through the eclipse. It's documented on Street View. As you follow the car down the street, the sun dims and streetlamps flicker as residents stare up at the sun (wearing their eclipse glasses, of course). 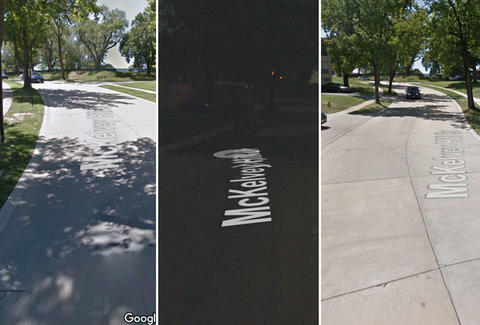 The weird stretch of street was pointed out to Space.com by Michael Kentrianakis, an eclipse chaser and member of the American Astronomical Society's Solar Eclipse Task Force. "I guess those Google vans photographing every road on the planet don't stop for nothing," he wrote on Facebook. "Not even during the night of a total solar eclipse." Kentrianakis's Facebook post features screengrabs, including an impressive "diamond ring" effect that can be seen in the sky where the moon is passing in front of the sun. You can even see crescent shadows on the ground under trees. Relive the good times on the map below, because another total solar eclipse won't cut a path through the United States until 2024.